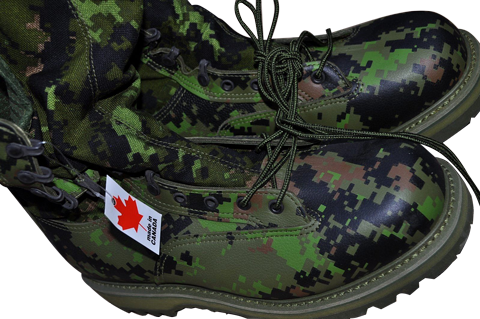 The Canadian Armed Forces have introduced such an interesting novelty as CADPAT (Temperate Woodland Camouflage) Combat Boots. 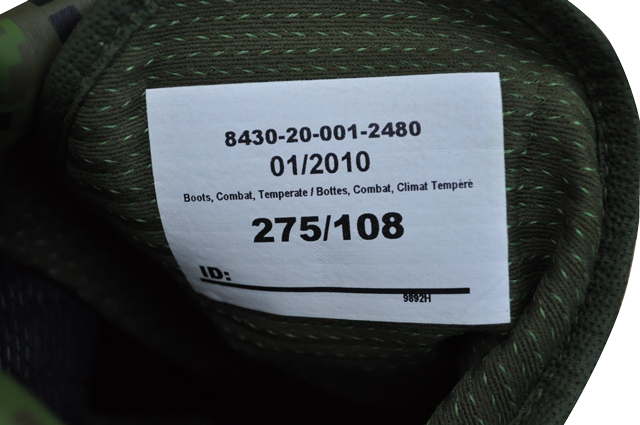 These boots have become a part of the Improved Environmental Clothing System (IECS) for the individual soldier. Similarly to US Army Gen III ECWCS Extreme Cold Weather Seven Layer Clothing System and the other International Clothing System, the IECS is based on the principle of layering, allowing the soldier to regulate body temperature through adding or removing layers. So the IECS represents by itself a fully integrated clothing system to protect the Canadian Forces (CF) soldier in conditions ranging from wet cold to extreme cold. - Combat Sock System, including Liner Socks, Temperate Socks and Cold Weather Socks. 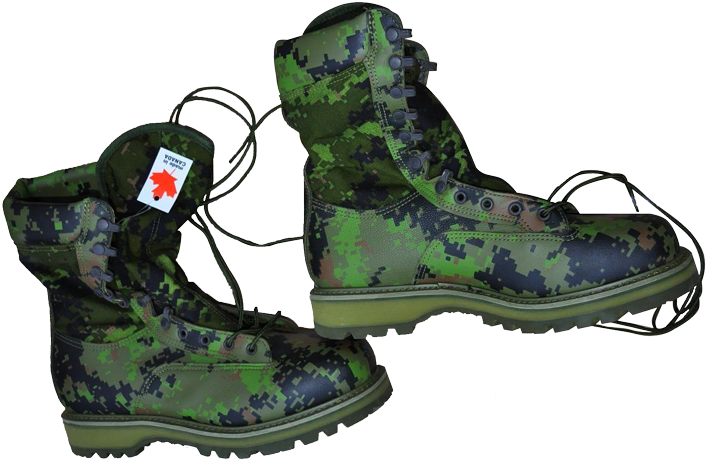 The Canadian CADPAT -TW (Temperate Woodland) Camouflage combat boots are basically the same in construction and features as the Canadian regular black boots for temperate climate, but with the camouflage- painted surface, both pebbled leather and textile fabrics (Gore-TEX). 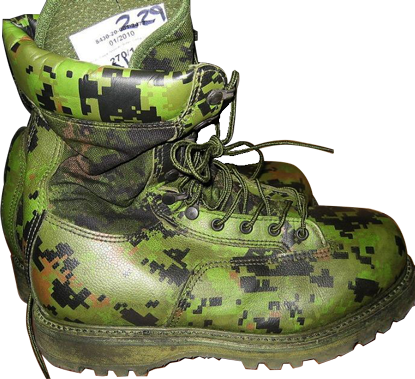 These CADPAT camouflage boots look very bright, with vivid colors. 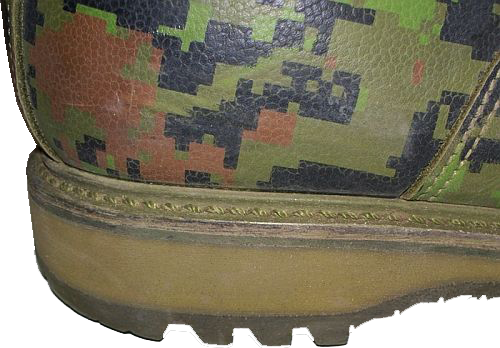 The lacing system of CADPAT boots features simple round eyelets at the foot (four pairs) and speed-lacing eyelets in the upper part (six pairs), the lower three pairs of speed-lacing eyelets are subdivided by two dent-shaped cutouts. 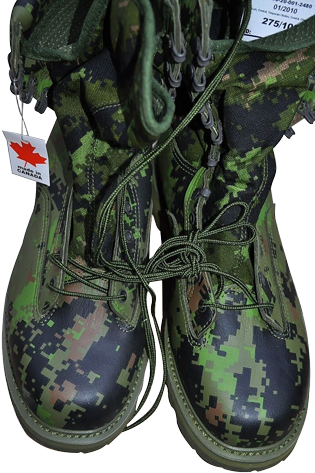 Bright-green-colored laces are made of 100% nylon and are very similar in outlook appearance to the laces of the US Armed Forces. 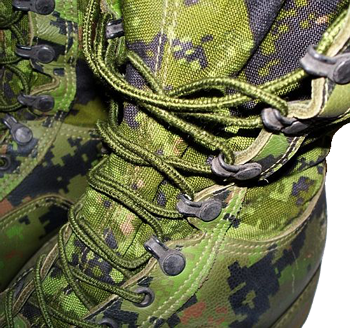 The outer surface of the boot's tongue is camouflage-colored, as well the other fabric parts of boot's top. Black PU-insoles are anatomically-formed and feature green fabric cloth surface. The insoles can be changed to more thick and warm ones in case of need. 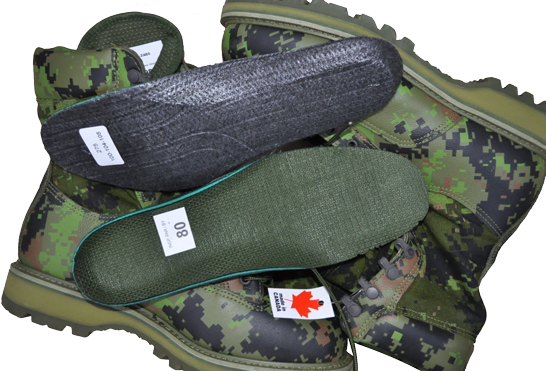 All the insoles are marked with military identification tags and size identification. These soft, cushioned inserts provide arch support and can usually be removed and replaced. The mid-sole is made of cushioned polyurethane, a layer of shock-absorbing material that helps dampen impacts on rugged terrain. 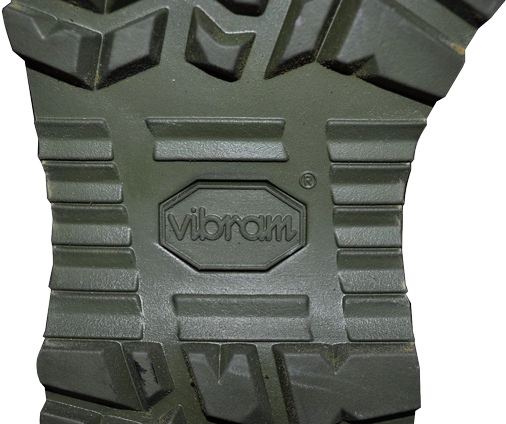 The 100% rubber out-sole is the Vibram® "Sierra®" tread pattern design for enhanced traction. In result this lightweight sole offers cushioning and flexibility, shock absorption and good durability. 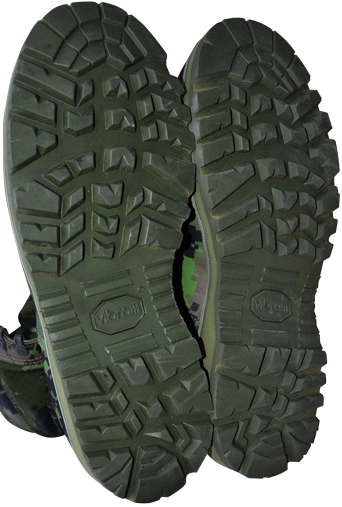 The shank, a stiff piece of material is inserted between the mid-sole and out-sole to provide torsional stability, while Vibram® out-soles provide good traction and durability on diverse and rugged terrains. The CADPAT-painted soft padded collars in the upper part of these high-cut boots cover above the ankles and provides superior support on rough, uneven terrains along with stability when one is carrying a heavy back-pack. Also the collar provides extra comfort of wear and helps to keep moisture, mud, dust, sand, debris, and other foreign substances out.